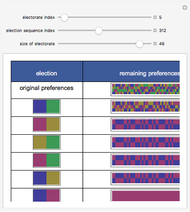 This Demonstration shows how the sequencing of binary elections, in which voters choose between two alternatives, winnows multiple alternatives down to a single "winner." You can select (a) an electorate index that specifies the preferences amongst the magenta, blue, green and golden choices among all members of the electorate, (b) an election sequence index that specifies the sequence of choices faced by voters, and (c) the size of the electorate that will be permitted to vote. The Demonstration outputs rows showing, in the left column, the alternatives available in the election, and, in the right column, the electorate's preferences among the choices remaining after the loser from the binary election has been culled. 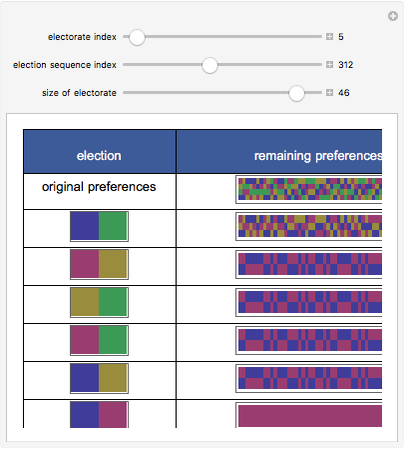 The bottom right cell shows the choice that wins as a result of the election process. Some political theorists have deprecated the capability of democracies by noting that control over the agenda and over the sequence of voting can lead to different electoral results. Arrow's impossibility theorem and considerable derivative work addresses this issue. This Demonstration helps see the circumstances under which these theoretical problems are likely to arise. As users will note, although it certainly does occur, it is somewhat unusual for the voting sequence to end up affecting the ultimate result. Although the Demonstration shows only binary elections, the underlying code works on elections in which more choices are available and in which only the winning choice survives until the next round. Sometimes, one or both of the choices in an election will no longer be available due to prior elimination. In that instance, the election is essentially "skipped" and the preference structure remains unchanged. Seth J. Chandler "Binary Election Sequences"